The 54 metre sailing yacht Parsifal III has been listed for sale by Alex Lees-Buckley at Camper & Nicholsons International. Designed by Ron Holland, she was built in aluminium by Italian yard Perini Navi to ABS class and MCA coded with delivery in 2005, going on to win Superyacht of the Year and Best Sailing Yacht Interior in the 2006 World Superyacht Awards. An interior by Remi Tessier uses a blend of dark ebony, wenge and light sycamore woods complemented by natural textiles to accommodate up to 14 guests in six cabins. These consist of a master suite with direct access to the swim platform, three doubles and two twins with Pullman berths, all with entertainment centres, HD television screens and en suite bathroom facilities. In addition, there are quarters for nine crew. Her main saloon and dining area open fully onto the aft deck and can also be opened forward to the wheel house giving a unique 360 degree view from within. Here guests can relax on comfortable settees in front of an entertainment centre that includes a 50 inch Samsung LED television screen and a Kaleidescape server offering on demand video and audio. Outdoor dining on this yacht for sale is available on the main aft deck and she also boasts a large flybridge with full dual helm stations, a Jacuzzi, bar and Teppanyaki grill, along with several areas where guests may simply lounge in the sun or choose to enjoy al fresco meals and drinks. A single 1,500hp Caterpillar engine gives her a cruising speed of 11 knots and a range of 4,500 nautical miles. 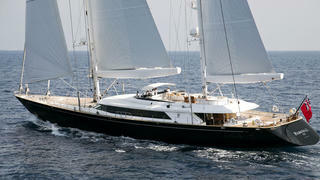 Lying in Spain, Parsifal III is asking €20.5 million.